Revaluate will help you identify the Contacts in your Propertybase account that are most likely to move in the next 3-6 months. This page will provide installation steps and a general overview of the Propertybase Revaluate Integration. For more information about Revaluate and how data is collected, click here. Haven't installed Revaluate yet? Contact your Account Executive or Propertybase Support for more information. Once Revaluate has been installed, follow the steps below to complete the setup process. From the Control Center, click Revaluate. First, we need to locate your Revaluate API Key. This is how Propertybase will communicate with Revaluate. Click your name in the top right corner and then click Profile. Copy the API key located on this page. Paste the API key where is says "Revaluate Key" and click Save Settings. Nice work! Your Propertybase and Revaluate accounts are now connected. Next, click the "Configuration" tab (at the top of this page) to add Revaluate to the appropriate pages. Next we need to add the Revaluate component and appropriate fields to the page layout for the Contact record. 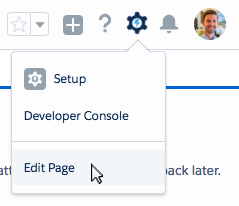 Open any Contact record, then click the gear icon in the top right menu and click Edit Page. Drag the Revaluate component (under the left side Custom - Managed list) to right above Activity and Chatter. Done! The Revaluate component is now available to all Contacts. Just installed Revaluate? Time to sync some Contacts! There are two ways to sync Contacts from Propertybase to Revaluate; individually or through bulk upload. Note: Haven't configured Revaluate yet? Refer to the first two tabs on this page before continuing. To sync Contacts individually, simply navigate to any Contact record and click the Revaluate button. Note: In order for Revaluate to generate a score, the Contact must have an email address on record. Once the button has been clicked, Propertybase will send Contact details to Revaluate. Initially, no information will be displayed. However, if you wait 10-15 seconds and click the "Refresh Revaluate Data" button - initial information will be displayed from Revaluate. For more information on syncing data, refer to the "FAQs" tab on this page. Note: The Revaluate Control Center page is available to Administrators only. Once your selection has been made, click the Upload Selected Contacts button. Once submitted, Propertybase will add selected Contacts to an upload queue. You can see the status of this upload below the "Bulk Upload Contacts" heading. To update this status, simply refresh the page. Revaluate is not returning any data, why is this? It takes 10-15 seconds for Propertybase to send data to Revaluate and receive the results. If it's your first time syncing a Contact, click the "Refresh Revaluate Data" button 10-15 seconds after the initial sync. Most of the time, basic information like gender will be available immediately. However, it can take up to 48 hours for Revaluate to retrieve all possible data. In rare cases, the email address of the Contact you are trying to sync will already exist in Revaluate's database. When this happens all data will be available immediately. Do I have to manually sync Contacts to keep Revaluate data up-to-date? No! After a Contact has been synced once (through individual sync or bulk upload), Propertybase will batch refresh data from Revaluate every 24 hours. Batch refresh only works for Contacts previously synced to Revaluate. If you would like to retrieve the latest data manually, you can always click the "Refresh Revaluate Data" button on any Contact record.